Bettina is said to be the most beautiful woman to have ever lived in the legendary Chelsea Hotel in New York City, according to residents, yet has hidden herself away in her studio for over 40 years. She sleeps on a lawn-chair and surrounds herself with boxes stacked from floor to ceiling, filled with works of her art that have never seen the light of day. These boxes hide a stunning body of work - but it's come at a huge cost. Her life as a reclusive guardian over her creativity and artwork inspires us to think about the world that we have each chosen for ourselves, how we are captive of it or freed by it. During humorous, intimate and provocative moments, first-time director Corinne van der Borch develops a delicate friendship with Bettina and gradually unveils the life of one of New York's last true eccentrics. 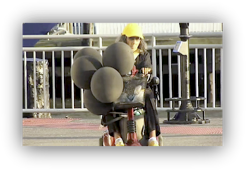 "Girl With Black Balloons is a beautifully conceived excavation -- part archeological, part psychological -- into the life and times of a truly authentic New York City character."